Natural Killer (NK) cell mediated tumor cell killing is one prominent mode of action for anti-cancer or anti-infectious antibodies. It relies on the antibody´s ability to recruit NK cells, which is enhanced when the antibody Fc glycan is devoid of fucose. 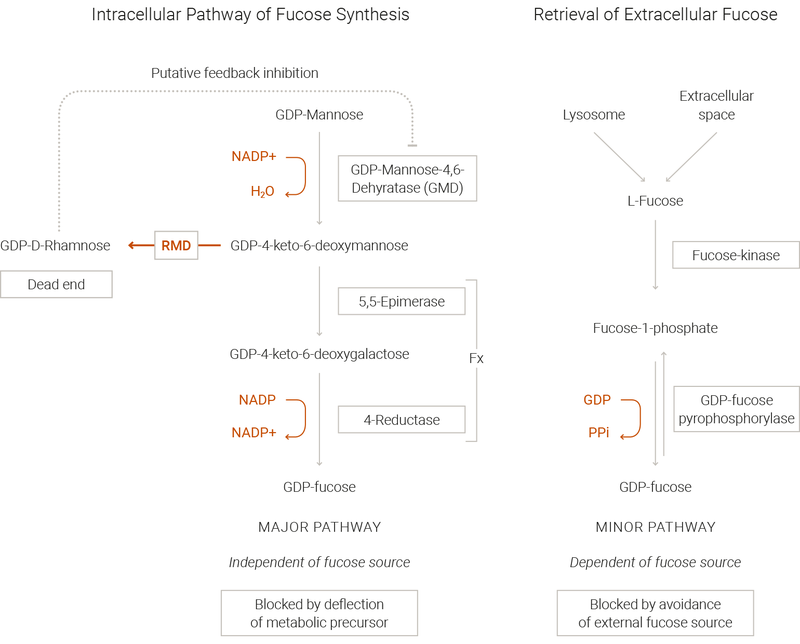 Rather than knocking out any genes, ProBioGen redirects fucose synthesis by a heterologous enzyme that depletes the fucose pool inside the cell. Such cells produce afucosylated antibodies with up to 100x higher ADCC activity against tumor cells or virus-infected cells. Our proprietary GlymaxX® technology can be applied to your standard host cell line. Alternatively, we can offer our own optimized GlymaxX host cell line, or even re-engineer existing producer clones. GlymaxX cell lines are stable and compatible with highest titer production processes. The unique advantage of the GlymaxX technology is that a single cell line is sufficient to produce both completely fucosylated or afucosylated antibodies and those with a defined intermediate fucosylation level. We adjust the level via fucose supplementation in the culture medium. The technology is endorsed by licensees worldwide and applied to antibodies that are currently in clinical studies. Figure 1: Antibodies produced from GlymaxX-engineered cells contain a reduced amount of core-fucose and show an increased ability to recruit NK-cells and mediate an efficient antibody dependent cellular cytotoxicity (ADCC) response. Are you looking to enhance your program or are you just curious about our company, services, and technologies? Connect with our team and we will get back to you shortly. * If you provided a telephone number or an email address above, you hereby consent into us (see legal notice) contacting you using one of the given communication channels in order to reply to your request. Note: The right to object concerns the processing of data based on our legitimate interest (Art. 6 lit. f GDPR) as well as the processing for direct marketing. You can revoke your consent at any time for the future by e-mail to cmo@probiogen.de. Detailed information on the handling of user data can be found in our Data Protection Statement.